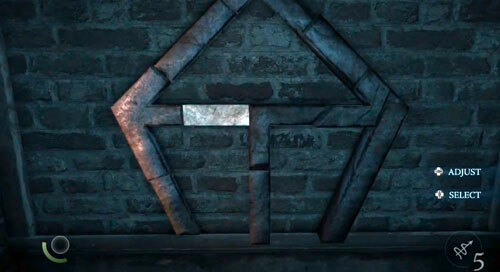 There was plenty of puzzles in Thief, but only one of them was interesting. Otherwise they were just poking around and moving stuff around. This one was found in a house that wasn’t very big, but took time to navigate due to moving walls. This one is in the basement. Its in the Clockwise sidequest, where you need to locate a part of an automaton for a mad inventor of sorts. I guess this one can be completed in the very same manner, but I didn’t want to do that. Instead I approached it differently. The idea is that in the beginning each of the pieces is in the outer position. When you push a piece in or pull it out, each piece next to it also switches position. You need to get all pieces in. I found a five move solution, but I was wandering whether less would do. I doubt it, though. My solution after the break. So, what I did was make a graph out of the puzzle. 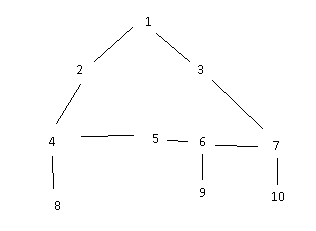 It has ten pieces and each is connected to one, two, or three other pieces. Doesn’t look very good, but it looks much better than the pencilled one I worked with. Now, since we need each piece in the inner position, and they are in the outer position in the beginning, we need to switch each part an odd number of times. Mostly once, if we do it five times or more, we’re very probably doing something wrong. By just testing, we’ll see this is actually pretty hard. For example, if we push 10 (switching 7), then 9 (switching 6), then 4 (switching 2, 5 and 8), this leaves us with 1 and 3 in the outer position and we can’t get the whole thing in. But if we use the knowledge of needing to switch each one an odd number of times, we know that the ones we need to switch more than once must be the ones which are connected to three or more other pieces. This means we only have three candidates: 4, 6 and 7. Based on this (and this was more instinct than cold calculation) I started with 7 (switching 3, 6 and 10), then 9 (switching 6 again), then 5 (switching 4 and 6 for the third time), then 8 (switching 4 again) and finally 2 (switching 1 and 4 for the third time). There you have it. Five move solution. I’m not sure there is another solution, but what I’m interested in is that is there a generalized solution for similar puzzles? Probably is. Just couldn’t come up with one whilst down with a flu. This entry was posted in Uncategorized and tagged math by Aki Vainio. Bookmark the permalink.